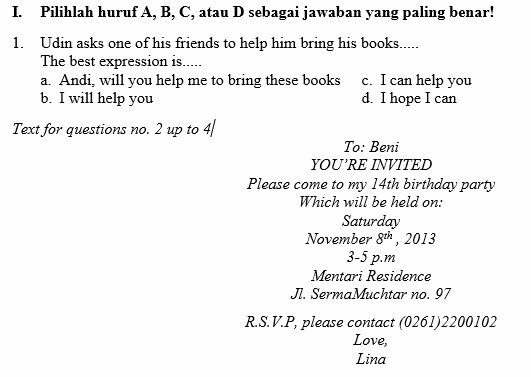 2. Who is invited to the party? 3. How old is Lina? 4. When will the party behold? My grandmother is a very gentle, loving and nice person. She is tall and thin. She never raise her voice at anyone. She takes care of me when mom and dad go to work. My mom and dad earn the money for our living. So, although I spend my time with grandma, I really love them. Grandmother likes to tell fairytale stories before I go to bed. She also usually tells me about my grandfather. He has passed away. My dear grandmother always says good things about him. She once told me that my grandpa is the nicest person she had ever met. 6. My grandmother is a very gentle, loving and nice person. 7. How does grandma’s body like? b. She’s tall and thin d. She’s loving person. 8. When does the writer’s grandmother tell fairytale? a. This is a cake for you. c. Yes, would you like a glass of lemon tea? b. Here are some bread for you. d. I don’t like eating sandwich. Mr. Warsidi has a garden in his yard, and he likes to work there. He says it is fun. Today he is planting flowers in the garden. There is also an old mango tree in the yard. He always cuts the leaves and the branches in taking care of it. He said that the flowers must get more sun. Mr. Warsidi often involves his children to take care together of the garden. So they will understand how to take care their environment. Many people tell Mr. Warsidi how beautiful his garden is. 10. What is Mr. Warsidi’s hobby? 11. What tree does he have in the yard? 12. How is Mr. Warsidi’s garden? 13. Mr. Warsidi’s … often help him to take care the garden. 15. How many sports are stated in the text? Mom, I borrowed your clutch bag, the one with black suede colour and two side pockets. I need it for Bima’s birthday party tonight. 18. Who wrote the short message? 19. The bag has … pockets. 20. Who has the birthday party? It started with my acne that showed up on my face. It was very annoying. It lowered my self-esteem and I was embarrassed to come out of my house and play with friends. Fortunately, my Mom gave me a good medicine. In three weeks, the acnes started to vanish although those showed some black spots in my face. That was my bad experience with adolescence although there were still lots of good experience too. 22. What showed up on the writer’s face? 23. Who gave a good medicine to the writer? WE WILL SERVE YOUR BREAKFAST UNTIL 10 a.m.
24. What does the notice mean? a. You will have breakfast at 10.00 a.m. c. You will have breakfast until 10.00 a.m.
b. The breakfast will be served at 10.00 a.m. d. The breakfast will be served after 10.00 a.m.
26. Where can you see the sign? 28. What kind of party is it? 29. Where will the party be held? 30. When will the party be held? Last year my family had a trip to Bali. My parents, my elder sister and I spent 3 days. We had a nice flight to Bali. We arrived at Ngurah Rai Airport at 9 a.m. Then, we checked in the hotel. It was not big, but comfortable. After a king a rest and having a shower, we had a lunch in the hotel restaurant. In the afternoon, we went to Kuta beach. There were a lot of tourists enjoying the beautiful beach. Some of domestic and foreign tourist surfed on the beach. It seemed they enjoy it. My sister and I played the sand. We built the castle from the sand. On the second day, we had a shopping in the traditional market near the hotel. My mother bought a new dress, while my father chose a leather jacket. My sister bought a pair of unique eye glasses and a cap. On the last day, we checked out the hotel. We left the hotel at 8 p.m. It was really an amazing holiday. 31. What does the text tell us about? 32. How did the writer go to Bali? 33. What did the tourist do on the beach? Open: Monday to Friday : 9 a.m. to 6 p.m.
Saturday and Sunday : 9 a.m. to 8 p.m.
37. A six year old child must pay … on Saturday and Sunday. 2. Do not pick the flowers in the park. 3. Do not swim in the lake. 4. Do not fish in the lake on any other day except Sunday. 5. Picnics are allowed only on Saturdays and Sundays. 6. The management will not be responsible for any loss or damage to personal belongings. 7. All visitors must leave the park at scheduled time. 38. How many rules for visitors are there? 39. Who make the rules? 40. What can we do in Happy Lake Garden? 41. Make an invitation to celebrate your birthday party on next Sunday, 6th December 2015 at 7 p.m. You will hold the party at California Fried Chicken Restaurant on Jl. Sudirman 17. Cockatoos are extremely affectionate, their feathers are very soft. They are really intelligent and very beautiful birds! Cockatoos love to show off and make comical displays with outspread wings, head bobbing, dancing and loud calls. They are very active and curious about their environment. 42. What is the suitable title for the text? 43. What is the meaning of “cockatoo”? 44. Rearrange the jumbled words into a correct sentence! Terima kasih ya, sangat bermanfaat buat saya.